For Georgian Bay, Ho! Ho! For Georgian Bay, Ho! Ho! My boys! It’s lively we do go! It’s time for us to go. Sheet home! And then belay! Hoist and back! Forestays’l! jibs! Up anchor! And fill away! Wing out fore, main and mizzen booms! Square yards! Haul taut! Belay! She’s bound for Georgian Bay. And up Lake Huron, Blue. ‘Way up in Georgian Bay. And inboard it is hove. At Georgian Bay, Ho! Ho! Close lower ports! Make fast! And caulk them up with oakum! The hold is filled at last. AT GEORGIAN BAY, HO! HO!. From Georgian Bay, Ho! Ho! This month’s song comes from an incredible, unpublished manuscript compiled by Joseph F. McGinnis. McGinnis was born in Kingston, Ontario in 1867 and was a sailor on the Great Lakes where singing played a similar role to what it did on seafaring vessels. After contributing Great Lakes songs and sea songs to collector Joanna Colcord in the early 1920s, McGinnis enthusiastically set out to add to his own repertoire/collection with songs gathered from other singers. He collected many songs via mail and even corresponded with Minnesota singer Michael C. Dean who sent him song lyrics and (with the help of a friend) transcriptions of song melodies. Sadly, McGinnis fell ill in the late 1920s and never succeeded in publishing his book. Another of McGinnis’s correspondents was folk song collector Robert Winslow Gordon. It was Gordon that ended up with McGinnis’s unpublished collection, “Songs of the Dogwatch,” which I accessed via the University of Oregon’s archival collection of Robert Winslow Gordon materials. McGinnis’s transcriptions of song melodies are somewhat erratic so I made some educated guesses in writing out the melody above. McGinnis wrote songs himself and “Georgian Bay, Ho! 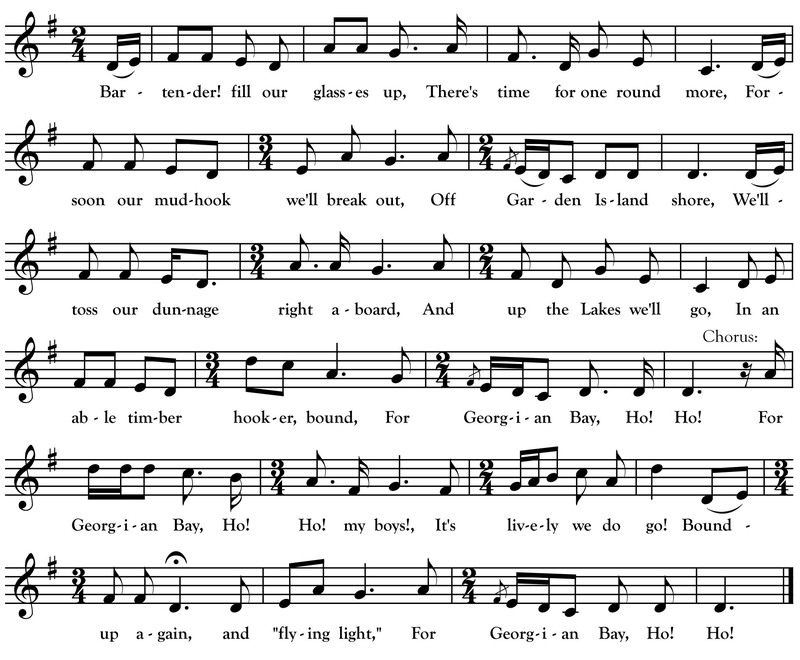 Ho!” was most likely one of his own compositions, though it fits well into the traditional style. Lake Huron’s Georgian Bay was a key access point to the vast pine forests of Ontario. The sailors in the song set off from (and return to) Garden Island—just outside McGinnis’s native Kingston. Garden Island was the base of a major shipping and lumber operation for most of the 19th century. Logs were squared off in the woods, loaded on ships in Georgian Bay, shipped to Garden Island, gathered into rafts and floated to Quebec City and, finally, loaded on to ships and shipped to Britain. The same timber ships that took Canadian wood to Liverpool transported Irish immigrants to Canada on the return trip.